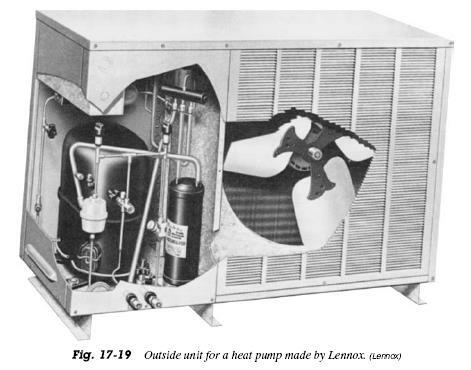 In the last fifty years, several large office buildings and small college campuses have been constructed using water-to-water heat pumps. Their capacities were up to several hundred tons. 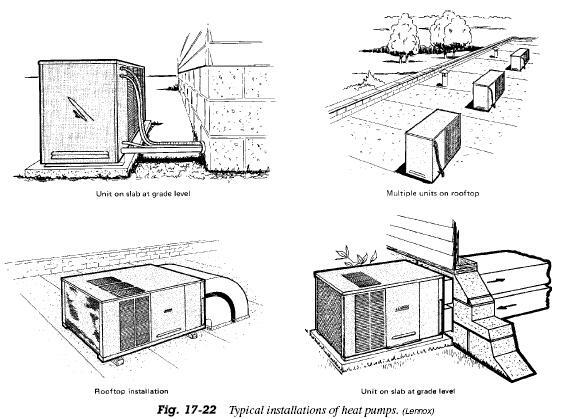 These systems usually use well water. That means two wells are used. One is used for supply and one for disposal. A possible arrangement is shown in Fig. 17-23. The supply and disposal wells are manually selected. Well water and return water are mixed, for both evaporator and condenser. This is done on a temperature basis. 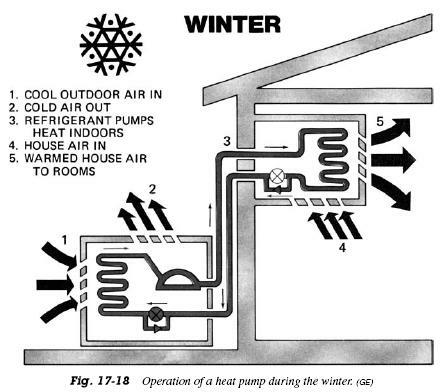 Under some conditions, this system can become an internal source heat pump. That is, when the exterior-zone heating and interior-zone cooling loads are in balance, or nearly so, little or no well water is needed. Internal source heat pumps without wells are used where there is sufficient internal cooling load to supply the net heating requirements under all conditions. Excess heat can be disposed of through cooling towers. 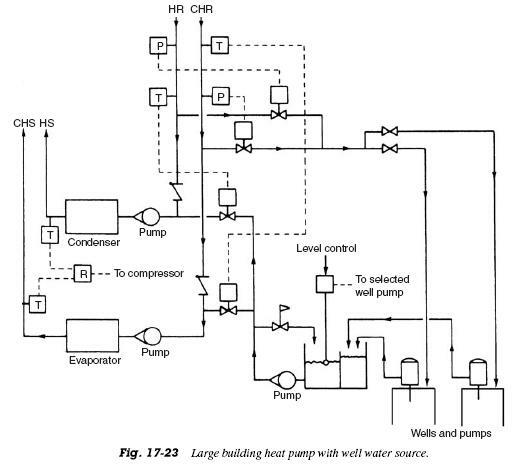 A problem with these systems is related to a high electrical load for the pumping system. A variety of variable-flow piping schemes have been devised to overcome this problem. On mild temperature heating days, the heat pump handles all heating needs. When the outdoor temperature reaches the “balance point” of the home (heat loss equals heat pump heating capacity), the two-stage indoor thermostat activates the furnace (secondary heat source). 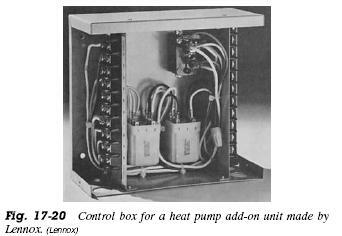 When the furnace fires, a heat relay deenergizes the heat pump. When the second stage (furnace) need is satisfied and plenum temperature has cooled to 90 to 100°F (32.2 to 37.8°C), the heat pump delay turns the heat pump back on. 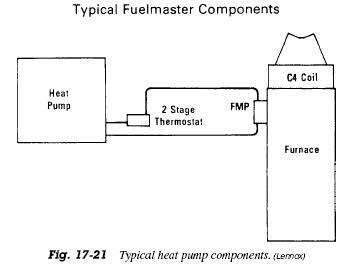 It controls the conditioned space until the second stage (full heat) operation is required again. When outdoor temperature drops below the setting of the low-temperature compressor monitor (field installed option) the control shuts out the heat pump. The furnace handles all of the heating need. The low temperature compressor monitor is standard on models dated 1974 and after. 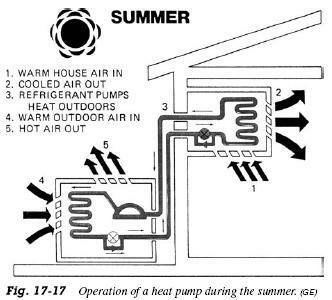 During the cooling season the heat pump operates in its normal cooling mode. It uses the furnace blower as the primary air mover. See Fig. 17-21. When the thermostat is set for heating, the chilled water pump is off. The pressure from the hot water pump moves the check ball to seal off the water in the chiller tank. See Fig. 17-5. Now the water in the chiller system is dormant. The hot water pump circulates the water from the hot water generator through the air handler and back to the generator through the water reservoir. During the heating cycle the reservoir also serves as a place to relieve air from the system. The tube from the top of the reservoir passes through the chiller tank and runs up to the distribution pan, which is open to atmospheric pressure.